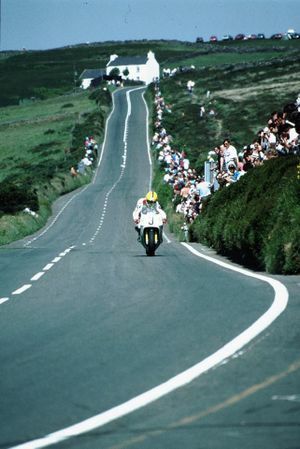 The late Joey Dunlop riding down from Kate's Cottage towards Creg ny Baa. The Isle of Man TT (Tourist Trophy) Race is a motorcycle racing event held on the Isle of Man since 1907. The race is run on public roads closed for racing by an Act of Tynwald (the parliament of the Isle of Man). The first race was held on the 28 May 1907 over 10 laps of the St. John's "Short Course" of 15 miles 1,470 yards for road-legal touring motor-cycles with exhaust silencers, saddles, pedals and mud-guards. The winner of the single-cylinder class and overall winner of the first event in 1907 was Charlie Collier riding a Matchless motor-cycle in a time of 4 hours, 8 minutes and 8 seconds at an average speed of 38.21 mph. The winner of the twin-cylinder class was Rem Fowler riding a Peugeot engined Norton motorcycle in a time of 4 hours 21 minutes and 52 seconds at an average speed of 36.21 mph. The trophy presented to Charlie Collier as the winner of the 1907 Isle of Man TT Race was donated by the Marquis de Mouzilly St. Mars. It featured a silver figurine of the Olympic God Hermes astride a winged wheel. The trophy was similar in design to the Montague Trophy presented to the winner of the Isle of Man Tourist Trophy car race. The Marquis de Mouzilly St. Mars Trophy is now presented annually to the winner of the Isle of Man Senior TT Motor-Cycle Race. Motor racing began on the Isle of Man in 1904 with the Gordon Bennett Car Trials and were originally restricted to touring automobiles. As the Motor Car Act of 1903 an Act of Parliament placed a speed restriction of 20 mph on automobiles the Secretary of the Automobile Car Club of Britain and Ireland approached the authorities in the Isle of Man for the permission to race automobiles on public roads. The Highways (Light Locomotive) Act 1904 gave permission in the Isle of Man for the 52.15 mile Highlands Course for the 1904 Gordon Bennett Car Trial. For the 1905 Gordon Bennett Car event it was decided to run a trial for motor-cycles the day after for a team to represent Great Britain in the International Motor-Cycle Cup Races. An accident at Ramsey Hairpin forced-out one of the pre-race favourites and the inability of the motor-cycle competitors to climb the steep Mountain Section of the course forced the organisers to use a 25 mile section of the Gordon Bennett Trial course. This ran from Douglas south to Castletown and then north to Ballacraine along the A3 primary road, but returned to the start at Douglas via Colby and Glen Vine along the current Snaefell mountain course in the reverse direction. The event was won by J.S. Campbell in 4 hours, 9 minutes and 36 seconds. During the 1906 International Cup for Motor-Cycles held in Austria, the event was plagued by accusations of cheating and sharp practices. During a conversation on the train journey home between the Secretary of the Auto-Cycle Club, Freddie Straight, Charlie Collier and Harry Collier brothers of the Matchless Motor-Cycles and the Marquis de Mouzilly St. Mars lead to a suggestion for a race the following year for road touring motor-cycles based on the automobile races held in the Isle of Man on closed public roads. The new race was proposed by the Editor of "The Motor-Cycle" Magazine at the annual dinner of the Auto-Cycle Club held in London on the 17 January 1907. It was proposed that the races would run in two classes with single-cylinder machines to average 90 mpg and twin-cylinder machines to average 75 mpg fuel consumption. To emphasize the road touring nature of the motor-cycles there where regulations for saddles, pedals, mudguards and exhaust silencers. For the 1908 race the fuel consumption was raised to 100 mpg for single-cylinder machines and 80 mpg for twin-cylinder machines and the use of pedals was banned. The race was won by Jack Marshall on a Triumph motor-cycle at an average speed of 40.49 mph. For the 1909 event the fuel consumption regulations was abandoned along with the use of exhaust silencers. The single-cylinder machines where limited to a capacity of 500cc and the twin-cylinder machines to a 750cc engine capacity. Due to the concern over increasing lap-speed, the 1910 event saw the capacity of the twin-cylinder machines reduced to 670cc. However, Harry Bowen riding a BAT twin-cylinder motor-cycle increased the lap record to an average speed of 53.15 mph, later crashing-out of the 1910 event on the wooden banking at Ballacraine. The first TT race over the Snaefell mountain course took place in 1911. This was followed in 1923 with the introduction of the Manx Amateur Motorcycle Road Races - a race originally reserved for amateurs and raced on the same Mountain Course. In 1930 it changed its name to the Manx Grand Prix. For the 1911 event two separate races where introduced. A four lap Junior TT Race for 300cc single-cylinder and 340cc twin cylinder motor-cycles. The 1911 Senior TT Race was open for 500cc single-cylinder and 585cc twin-cylinder motor-cycles and was contested over 5 laps of the new 37.5 mile Mountain Course. The first event on the new course was the Junior TT Race and was contested by 35 entrants. It was won by Percy J. Evans riding a Humber motorcycle in 3 hours, 37 minutes and 7 seconds at an average speed of 41.45 mph. The new technical challenges of the Mountain Course forced changes on entrants and motor-cycle manufacturers alike. The American Indian Motor-Cycle factory fitted a two-speed gearbox and chain-drive. This proved to be the winning combination when Oliver Godfrey won the 1911 Isle of Man Senior TT riding an Indian in 3 hours, 56 minutes and 10 seconds at an average speed of 47.63 mph. In contrast the Matchless motor-cycles where fitted with a six-speed belt drive and Charlie Collier riding a Matchless motor-cycle finished second in the 1911 Senior TT race but was later disqualified for illegal refueling. During practice for the 1911 race Victor Surridge died after crashing his Rudge motor-cycle at Glen Helen. For the 1912 event the single and twin cylinder classes where combined with a 350cc capacity limit for the Junior TT and a 500cc capacity for motor-cycles for the Senior TT race. In 1913 Major Tommy Loughborough replaced Freddie Straight as secretary of the Auto-Cycle Club and promptly decided to make the races more difficult. The Junior and Senior races where to be run in sections. The Junior TT race was divided into two races of two and four laps and the Senior TT race consisted of a three lap race followed by a four lap race combined with the Junior TT event. In 1914 the Junior TT was reduced to 5 laps and the start-line moved to the top of Bray Hill to increase paddock space of the competitors. The use of crash-helmets was made compulsory. The 1914 Junior TT was held in heavy rain and mist on the Mountain Section of the course and was won by Eric Williams riding an AJS motor-cycle in 4 hours, 6 minutes and 50 seconds at an average speed of 45.58 mph. The race was marred by the death of Frank Walker riding a Royal Enfield motor-cycle who had been leading until a puncture on the third-lap. In the following pursuit of the leaders he fell twice and on the last-lap over-shot the finish line in Ballanard Road and crashed into a wooden barrier placed across the road and posthumously declared a third place finisher by the ACU race commitee. Motor-Cycle racing in the Isle of Man did not restart after the end of the First World War until 1920. Changes where made to the Snaefell mountain course and competitors now turned left at Cronk-ny-Mona and followed the primary A18 Mountain Road to Governors Bridge with a new start/finish line on Glencrutchery Road which lengthened the course to 37 ¾ miles. The 1920 Junior TT Race included for the first time a new Lightweight class for motor-cycles of 250cc engine capacity. The Lighweight class of the 1920 Junior TT race was won by R.O Clarke riding a Levis and he may have won the event overall but crashed at the 33rd Milestone on the last lap, finishing fourth overall. The 1921 Senior TT race was won by Howard Davies riding a 350cc Junior TT Race motor-cycle by a margin of 2 minutes and 3 seconds from Freddie Dixon and Hubert Le Vack. For 1922 the ACU introduced for 250cc motor-cycle a Lightweight TT race and the first winner was Geoff S.Davison riding a Levis motor-cycle at an average race speed of 49.89. The 1922 Junior TT Race was won by local Isle of Man competitor Tom M.Sheard riding an AJS motor-cycle at an average race speed of 54.75 mph. Despite crashing twice, a broken exhaust and a fire in the pits, Stanley Woods riding a Cotton managed to finish in 5th place in the 1922 Junior TT Race. In the 1922 Senior TT Race, Alex Bennett riding a Sunbeam motor-cycle led all 6 laps from start to finish to win from Walter Brandish riding a Triumph. More changes to the course followed in 1923 with the adoption of a private road between Parliament Square and May Hill in Ramsey. The course had previously had negotiated Albert Road and Tower Road in Ramsey and the new course length was now 37.739 miles. Part of the Snaefell mountain course was named 'Brandish' after Walter Brandish crashed at a corner between Creg-ny-Baa and Hillberry and broke a leg. The first Side-Car TT race was held in 1923 over 3 laps (113 miles) of the TT course and was won by Freddie Dixon and passenger Walter Perry with a special Douglas banking-sidecar average race speed of 53.15 mph. The Senior TT Race of 1923 was held in poor weather and local course knowledge allowed local Isle of Man competitor Tom Sheard riding a Douglas motor-cycle to win his second TT Race to add to his first win in the 1922 Junior TT Race on an AJS motor-cycle. Another first-time winner of a TT race in 1923 was Stanley Woods riding to victory in the Junior TT Race on a Cotton. In 1924 an Ultra-Lightweight TT Race was introduced for motor-cycles of 175cc engine capacity following the introduction of a Lightweight TT Race in 1922. The 1924 Ultra-Lightweight TT was allowed to begin with a massed-start for competitors rather than pairs for the normal time-trial format of the Isle of Man TT Races. The first winner of the Ultra-Lightweight TT in 1924 was Jock Porter riding a New Gerrard motor-cycle at average speed of 51.20 mph. The Lightweight TT and the Senior TT Races of 1924 where run in conjunction and Eddie Twemlow (the brother to Ken Twemlow) riding a New Imperial motor-cycle won at an average race speed of 55.44 mph. The Senior TT Race of 1924 like the Junior TT Race of the same year was also run at record breaking pace and was the first with a race average speed over 60 mph and was won by Alec Bennett riding a Norton motor-cycle. After numerous retirements in 1924, Wal Handley won the 1925 Junior TT Race over 6 laps of the Mountain Course for Rex-Acme motor-cycles at an average speed of 65.02 mph. Later in the week Walter Handley became the first TT rider to win two races in a week when he won the Ultra-Lighweight TT Race again on a Rex-Acme motor-cycle. The 1925 Senior TT Race was sensationally won by Howard Davis while competing against the works teams with a motor-cycle of his own manufacture a HRD Motorcyclesat an average speed of 66.13 mph. Further changes occurred in 1926 with the scrapping of the Side-Car and Ultra-Lightweight TT Races from the lack of entries. Most of the TT Course had now been tarmacked including the Snaefell Mountain Section. Another change in 1926 was the ban on alcohol based fuels forcing competitors to use road petrol. Despite these changes the prestige of the Isle of Man TT Races had encouraged the Italian motor-cycle manufacturers Bianchi, Garelli and Moto Guzzi to enter. The 1926 Lightweight TT Race produced one of the most notorious events in the history of the Isle of Man TT Races described by the "The Motor-Cycle" Magazine as the "Guzzi Incident." The Italian rider Pietro Ghersi was excluded from second place for using a different sparking-plug in the engine of his Moto Guzzi. The 1926 Senior TT Race produced the first 70 mph lap and was again set by Jimmy Simpson on an AJS motor-cycle in 32 minutes and 9 seconds an average speed of 70.43 mph. More changes occurred in 1927 with a fatal accident during practice to Archie Birkin a brother to Tim Birkin of the Bentley Boys fame. The corner in Kirk Michael where the accident occurred was renamed Birkin's Bend and from 1928 practice sessions where held on closed-roads. The newly developed 'positive-stop' foot gear-change by Velocette gave Alex Bennett his fifth TT Race win in the 1928 Junior TT Race at an average race speed of 68.65 mph from his team-mate Harold Willis. The 1929 Lightweight TT Race was led for 5 laps by Pietro Ghersi on a Motor Guzzi competing in his first TT race since the disqualification in the 'Guzzi Incident' of 1926. Despite Pietro Ghersi setting the fastest lap at an average speed of 66.63 mph, engine failure gave the win to Syd Crabtree. During the 1929 Senior TT Race a number of riders crashed at Greeba Castle after Wal Handley clipped the hedge and crashed. This included Jimmy Simpson, Jack Amott riding for Rudge and Doug Lamb who latter died of his injuries on the way to Nobles Hospital. Charlie Dodson completed a Senior TT double by winning the 1929 Senior TT Race at an average race speed of 72.05 mph. The 1930s was a decade which the TT Races became the predominant motorcycling event in the racing calander and perhaps seen as the classic-era of racing in the Isle of Man. A number of changes occurred to the Mountain Course during the 1930s with extensive road widening on the A18 Mountain Road and the removal of the hump-back bridge at Ballig for the 1935 racing season in the Isle of Man. The 1930s produced a number of changes for the Isle of Man TT Races in which the event became more commercialized. The George Formby film No Limit (1936 film) used the 1935 Isle of Man TT races as a backdrop for filming. Also, the 1930s was increasingly used by the motorcycle manufacturers to show-case their products by racing at the Isle of Man TT Races. As a result, the 1930s produced an increased pace of motor-cycle development with the introduction of over-head camshaft engines, plunger rear-suspension and telescopic front-forks. These technological improvements where played-out by the different British motor-cycle manufacturers such as AJS, Rudge, Sunbeam and Velocette gradually being eclipsed by the pre-eminence of the works Nortons. Increasing interest by foreign manufactures in the 1930s produced works entries from BMW, DKW, NSU, Bianchi and Moto Guzzi at the Isle of Man TT Races. Increased professionalism by the TT riders during the 1930s was the reason for Stanley Woods parting with Norton motor-cycles, despite the winning of four TT Races in 2 years, over the issue of prize money and joined Husqvarna and later riding for Moto Guzzi and Velocette. The 1930 Senior TT Race was won by Rudge with Wal Handley becoming the first TT rider to win in all three major TT Race classes and the first lap under 30 minutes of the Mountain Course. The 1931 TT Race meeting was again dominated by the battle between Rudge and Norton motor-cycles. The 1931 Senior TT Race provided Tim Hunt with a popular Junior/Senior double win and also produced the first 80 mph lap by Jimmy Simpson on a Norton motor-cycle. The 1932 TT Race meeting was watched byPrince George, Duke of Kent the first royal visitor to the Isle of Man TT Races. The 1932 Senior TT Race provided Stanley Woods with the "Norton Habit" and another Junior/Senior double win. Also on the first lap Wal Handley riding for Rudge crashed at the 11th Milestone sustaining a back injury and retired and the place on the TT Course where the incident occurred was renamed Handley's Corner. The 1933 Senior TT Race gave Stanley Woods another Junior/Senior double win and the works Norton's taking the first four places along with Jimmy Simpson, Tim Hunt and Jimmie Guthrie. The 1934 TT Races was another double Junior/Senior win for Jimmie Guthrie and the last TT Race for Jimmy Simpson. For the 1935 TT Races, Stanley Woods provided another surprise by moving to Moto Guzzi and was a debut event for the Italian Omobono Tenni. The 1935 Senior TT Race produced one of the most dramatic TT races as the Moto Guzzi pit-attendants made preparations for Stanley Woods to refuel on the last-lap went straight through the TT Grandstand area without stopping and went on to win by 4 seconds from Jimmie Guthrie. Despite disqualification during the 1936 Junior TT Race, Jimmie Guthrie won the 1936 Senior TT Race and was revenge for the dramatic defeat the previous year. The 1937 TT Races produced the first foreign winner when the Italian TT Rider, Omobono Tenni won the Lightweight Race, although Jimmie Guthrie was killed a few weeks later while riding for the Norton team during the 1937 German Grand Prix. The 1938 TT Races produced the first German winner when Ewald Kluge won the 1938 Lightweight TT Race and became the first overall European Motor-Cycle Champion for the works DKW team. For the 1939 TT Races, the works Norton team did not compete as the Norton factory where changing-over to war production. Although, the 1938 model Norton was provided to Harold Daniell and Freddie Frith to race, the 1939 TT Races provided Stanley Woods with a 10th TT win while riding a Velocette in the Junior TT Race and a well judged first win for Ted Mellors riding a Benelli in the 1939 Lightweight TT Race. The Blue Riband race of the Isle of Man TT Races was won for the first time by a foreign competitor when Georg 'Schorsch' Meier won the 1939 Senior TT Race riding for the factory BMW motor-cycle team. The 1930s was an era when TT winners were allowed to keep the trophies for a year. The 1939 factory BMW motor-cycle that won the 1939 Senior TT Race spent the war-year buried in a field and the Senior Trophy was discovered displayed in a shop in Vienna at the end of the war. Motor-Cycle racing did not return to the Isle of Man and the Mountain Course until September 1946 with the first post-war event the 1946 Manx Grand Prix. For the 1947 Isle of Man TT Races a number of changes occurred to the race schedule with the inclusion of a Clubmans TT Races for Lightweight, Junior and Senior production motor-cycles. The 1949 Isle of Man TT Races was the first event of the inaugural Motorcycle Grand Prix World Championship and Les Graham the first 500cc World Champion finished 10th in the 1949 Senior TT Race. For the 1951 Isle of Man TT the Ultra-Lightweight TT Race was re-introduced that was won by Cromie McCandless riding a Mondial motor-cycle at an average race speed of 74.84 mph. From 1947 to 1959 there occurred a number of course changes and improvements. Road widening occurred between the 33rd Milestone and Keppel Gate for the 1947 season and further major changes for the 1954 Isle of Man TT Races with significant alterations to Ballaugh Bridge, Creg-ny-Baa, Signpost Corner and Governor's Bridge. Also the 1954 Isle of Man TT Races was the first year of the Clypse Course, the re-introduction of the Sidecar TT Race and the first ever female in Inge Stoll, to compete at an Isle of Man TT Race. The 1950's may be seen as a decade when the course and race changes the Isle of Man TT Races evolved into the motor-cycle event that occurs today. Perhaps seen as the 'golden-era,' the 1950's for the Isle of Man TT Races mirrored changes in the motor-cycling industry and motor-cycling technology and the increasing globalization of not only of motor-cycle racing, but also of the motor-cycle industry. As with the 1930's, the period from 1947 to 1959 the dominance of the British motor-cycle industry was gradually eroded by increased European competition. Again through the 1950's this was played-out through increased technological change. The introduction of the Featherbed Frame or the abortive Norton Kneeler concept by the works Norton team it was not sufficient to challenge the multi-cyclinder European motor-cycles from Gilera and Moto Guzzi. Financial problems led to the demise of the Norton team and along with other traditional British motor-cycle manufacturers AJS, BSA, Matchless and Velocette where replaced by European competition from CZ, DKW, Ducati, Mondial, MV Agusta and NSU at the Isle of Man TT Races. By the end of the 1950's, the East Germany motor-cycle firm MZ used the Isle of Man TT Races to improve their Walter Kaaden designed two-stoke technology. The 1959 Isle of Man TT Race was the first race for the fledgling Japanese Honda team when Naomi Taniguchi finished in 6th place in the 1959 125cc Ultra-Lightweight TT Race on the Clypse Course at an average race speed of 68.29 mph. Pre-war, the Isle of Man TT Races was seen as the preserve of British, Irish and Commonwealth competitors. This strangle-hold was first broken by Omobono Tennni as the first foreign winner in 1937. As the Isle of Man TT Races became a World Championship event in 1947, the post-war period produced race wins from European competitors such as Carlo Ubbiali and Tarquinio Provini. The first New Zealand winner was Rod Coleman in 1954 and first competitor from Southern Rhodesia was Ray Amm when he raced at the 1951 Isle of Man TT Races. Despite a win by Eric Oliver at the first post war Sidecar TT race, this also became dominated by German and Swiss competitors such as Walter Schneider, Fitz Hillebrand and Helmut Fath. For the Senior TT Race this was still dominated by new British TT competitors, Geoff Duke winning the 1955 Senior TT Race, John Surtees riding for MV Agusta and Bob McIntyre in the 1957 the Isle of Man TT races were headlined when he recorded the first 100 mph (161 km/h) lap, riding for Gilera motor-cycles. From 1949 to 1976 the race was part of the Motorcycle Grand Prix World Championship and was the home of the British Grand Prix. The event came under increasing scrutiny due to safety concerns despite efforts by the ACU to retain its world championship status. When Italian rider Gilberto Parlotti was killed during the 1972 TT, his close friend and the reigning world champion Giacomo Agostini, announced that he would never again race on the Isle of Man. More riders joined Agostini's boycott and by the 1976 season, only a handful of serious Grand Prix riders were among the entrants. Shortly after the 1976 TT, the FIM made the long-anticipated announcement. The TT, once the most prestigious race on the Grand Prix calendar, was stripped of its world championship status. The Grand Prix action was moved to the UK with the 1977 British Grand Prix being held at Silverstone. Today, the premier TT racing bikes are streamlined, technological wonders that complete the Snaefell course at an average speed exceeding 120 mph (193 km/h). Record holders include the late David Jefferies who set a then lap record of 127.29 mph (204.81 km/h) in 2002. This was surpassed by John McGuinness during the 2004 TT on a Yamaha R1 setting a time of 17 min 43.8 s equaling an average lap speed of 127.68 mph (205.43 km/h). McGuinness lowered this even further at the 2006 TT, setting a time of 17:29.26 for an average speed of 129.451 mph (208.33 km/h). The most successful rider was the late Joey Dunlop who won 26 times in various classes from 1977 to 2000. The Oxford Companion to World Sports and Games notes, "The oldest motor-cycle racing circuit still in use is the Snaefell mountain course over which the Isle of Man Tourist Trophy races are run. Starting at the town of Douglas on the south-east coast, the course takes a wide sweep to the west and north to enter the town of Ramsey on the north-east coast and thence return to the starting point, each lap measuring 37 3/4 miles (60.7 km) and taking in over 200 bends while climbing from sea level to an altitude of over 1,300 ft (396 m). This circuit is the epitome of the natural road course, all the roads used being ordinary public highways closed for the racing and practice sessions". Traditionally held in the last week of May and the first week of June, the TT races create a carnival atmosphere. Picnicking crowds flanking the circuit are reminiscent of the community festivals that are part of another form of cycle racing in a different country - le Tour de France. During the TT Festival it is difficult to travel across or around the island because of the road closures. There is a TT access road in Douglas that gives access to the center of the mountain course during the event. The future of the TT is always in doubt with regards to the safety, especially "Mad Sunday" when any member of the public can ride the mountion section of the course which is open one way from Ramsey to Onchan. The TT races are extremely dangerous because of the high speeds on very narrow, twisting streets, roads and lanes flanked by stone walls and even buildings. Between 1907 and 2006 there have been 223 deaths (this number includes the riders killed during the Manx Grand Prix). In 2007 the TT will celebrate its 100th anniversary. Currently there is a Hollywood blockbuster being developed on the TT. Rumours have started to spread of a well-known sports car manufacturer supporting the event in the future. The late rally driver Tony Pond drove a standard production Rover 827 Vitesse during his second bid to be the first person to lap the Isle of Man TT circuit at over 160 km/h in a four wheeled vehicle. Tony, an Isle of Man resident and one of Britain's most famous rally drivers, almost made it during his attempt in 1988. Isle of Man TT by Charles Deane. History of the Isle of Man TT Races 1907-1989 by Nick Harris. The Magic of The TT. A Century of Racing over The Mountain. by Mac McDiarmid. This page was last edited on 28 November 2010, at 02:46.